Its been around seven months since my last post. I have found it difficult to find time to maintain this blog and come up with inspiration. Also, I am not a natural-born writer, and so even when I have a good idea, it sometimes takes a while to find the right words to express it. Anyway, enough with the excuses, It is exactly two years since my investing experiment began, so I thought I should give an update. The first thing to note is that there have not been any changes in the last five months. I am afraid that this is down to pure neglect on my part. Despite this, nothing in the current portfolio is below the sell limits. This may sound like an excuse, but I am coming to the view that a quarterly review strategy might work better than one that is constantly monitoring buy and sell signals. The second point to note is that these new purchases are all in the construction/property sector and so the portfolio has become rather concentrated (and it already held Persimmon). I don't have rules to manage sector diversity, so this is simply the way the cookie crumbled. I admit to being a little concerned about this, but not overly so. When stocks across a sector are generating both high Stockranks and appearances across multiple screens, then I think it makes sense to view this as a high "StockRank Sector" and I am quite happy being overweight in it. This certainly seems to have paid off. The construction/property stocks over the past 6-12 months have been the main engine of capital growth for the MB portfolio. Similarly, earlier in this experiment, the portfolio held a number of employment agencies which all played out well to varying degrees, with Staffline more that doubling in value. The general consensus on Stockopedia seems to advocate sector weighting to ensure broad exposure to different types of stocks. I don't really see the point in this. What would have been the point of having equal sector weighting in energy stocks 6 months ago when the the sector was tanking? I would rather be invested in a sector that was cheap and building momentum... like construction. This also happens to fit with one of my new ideas, which is to consider all 90-plus stocks, not just those with the very highest StockRanks. If one compares performance over the past year (18.6 per cent), this still looks very good against the FTSE 100 (3.2 per cent), but it was only slightly better than the FTSE 250 (15.9 per cent). Thus, the out-performance has very much been driven by the very good returns in the first year. Another noticeable feature in the above chart is the heroic performance achieved over the past month. This is explained by the aforementioned concentration of construction/property stocks and the big price increases across those sectors since the election. So there has been an element of luck here - If the Tories hadn't been able to secure an outright majority, then performance of the MB portfolio over the past year would have probably lagged the FTSE 250. Stockpedia's StockRanks perform well in aggregate over the long-term. These performance charts demonstrate this very clearly. Individual high StockRank picks do not work out every time. However, investing is a game of percentages and StockRanks offer very good odds. Even in aggregate, StockRanks do not work all the time. High StockRanks did not outperform the general market between about Feb 2014 and October 2014. Investing is a game of patience. There is no evidence that incorporating a "Screen of screen" metric helped improve returns. As the StockRank performance charts show I could have expected very similar returns from a random set of 90-plus StockRank stocks. Monthly checks against the buy and sell rules may be too frequent and may have resulted in bailing out of winning picks too soon. Again, investing is a game of patience. A quarterly based review with rebalancing within set limits would probably have been more effective. Fifteen stocks does not offer enough diversification against picks that go pear-shaped. I agree that 25 to 30 is sensible for the average private investors. 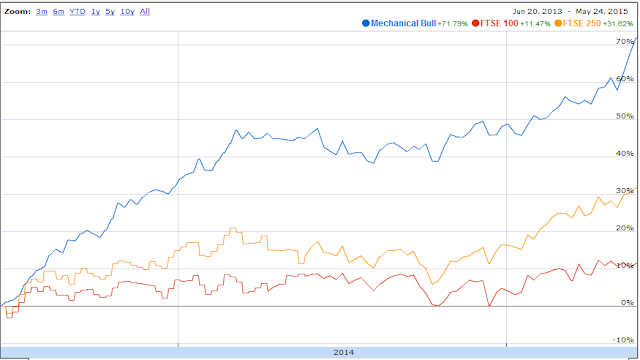 Mechanical investing works! My real life portfolio has achieved similar returns over the past two years and dreams of financial independence suddenly seem much closer. There are a couple of new ideas that I am working on so I'll mention these quickly. As I've said, I am not convinced that the Screen of Screens as a particularly useful metric. It has returned 35 per cent over the past 2 years, which is some way short of what one could have achieved from a simple 90-plus StockRank based system. But then how should one select from the pool of high StockRanks to get improved performance? A metric that looks interesting the PEG ratio, popularised by Jim Slater. A backtest of the Sharelock Holmes StockRank equivalent of top 8 per cent ranked stocks gives a 16.5 per cent average annual return over the past 10 years. However, if you throw in a screening rule of PEG less than 1, the annualised return increases to over 27 per cent. I'm now using this screen on Stockopedia as the foundation of my stock picks. A recent post on the Stockopedia discussion board mused on where the next market crash would come from. I don't have any answers but I am very interested in how best to protect my capital whenever it happens. From what I can tell StockRanks are unlikely to provide much protection and so one really need to be thinking about asset allocation. This article from John Kingham (UK Value investor) is over 5 years old, but it is the single most influential thing I have read over the past 12 months. The basic concept is to use the FTSE 100 Cyclically Adjusted Price Earnings (CAPE) as the basis for allocating capital between stocks and cash. When the CAPE is very low, one might go all in into stocks and when it is very high, one might move mostly into cash. The article demonstrates how over the long-term one can achieve similar returns to an "all in" strategy but with much lower drawdown (i.e. less risk). This is essentially another mechanical based strategy based on historical evidence so it very much chimes with my investment philosophy. Based on Kingham's analysis, the FTSE 100 can be currently considered "slightly cheap". I have started researching an asset allocation system but it is not yet ready for unveiling. No doubt a topic for a future blog post. In my last post back in September, I mentioned the fact that some commentators were saying that market was due a 10% correction. I argued that a pull-back in stocks seemed unlikely because it is perhaps one of the few asset classes left able to deliver real return. Given the market rollercoaster over the last month perhaps I should give up making predictions! On the other hand I was not entirely wrong. Although there was a whiff of panic in the markets, there was no obvious cause. The papers have been full of headlines on Ebola, but the broader geo-political and economic picture seem relatively unchanged. 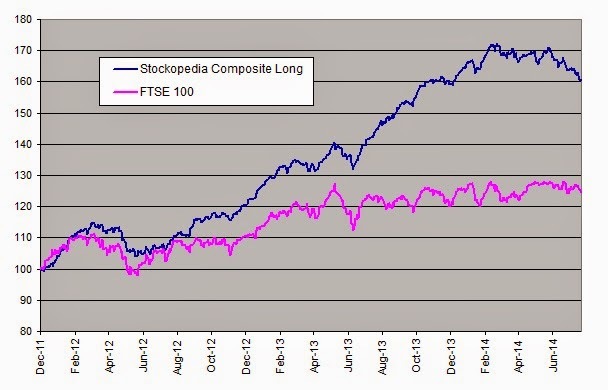 What's more, the FTSE 100 correction from peak to trough was barely 10% before it staged a 3% recovery last week. I am sure that many sellers have asked themselves what they should do now with their new found cash and decided to buy back in. This market blip seems to be just one of those things that happens from time to time. With this dip in the market I made the decision to go all in with this year's Stocks and Shares ISA allowance, so I had a busy time this week topping up my portfolio. I am now 80% in equities, which is as far as I want to go until the next lurch downwards. The Mechnical Bull portfolio held up pretty well during this correction (See chart below). Indeed it is already back at the level it was a month ago. Cohort (CHRT) has provided the strongest support for the portfolio over the past month increasing 20% followed by Pace (PIC) which has bounced back 12% following an extended decline. There was a change in the MB porfolio on 17 October. The MB score for Harvey Nash (HVN) dropped below 80 and so was sold at 88p for a small profit of 3.4%. This was disappointing given that the share price touched 125p in May. It was replaced by Cenkos (CNKS) which was scoring 104. Despite a Momentum score of 96, Cenkos is down 20% over the month. I have been reading James O'Shaugnessy's classic, "What Works on Wall St". I am already familiar with his ideas, but this is the first time I've gone directly to the source. In terms of his broad philosophy he is preaching to the converted although there a couple of things that he mentions that have given me pause for thought, particularly around managing risk. The overarching message of O'Shaugnessy's book is the importance of looking at what works over long time periods (i.e. over 50 years). Its good to be reminded of this when short-term events, like this months market dip consume our attention. In this post I expand on some earlier ideas on the under performance of Stockopedia's guru screens and some related thoughts around so called "fraudulent stocks". While the FTSE 100 increased by 2.9 percent in the last 6 months, all investment styles lost ground. Of the individual screens making up each up these composites, only nine out of 60 (long screens) beat the FTSE 100. The "Screen of screens" is a composite strategy flagging up stocks appearing in multiple screens. It is down 5.2 per cent over the last six months, about the same as the Mechanical Bull portfolio. As I've discussed in a previous post, these composite indices have tended to track the FTSE 250, which has pulled back about 5 per cent since it peaked at the end of February. My take is that the FTSE 100 is increasingly acting as a refuge for when financial markets enter a 'risk off' phase. During these times capital normally flows out of equities and into bonds. However, with the returns from gilts and corporate bonds so pitiful, money is instead flowing into defensive large caps paying consistent dividends. These are essentially stocks with bond-like characteristics. It is worth noting from the above chart that income strategies have performed best over the last six months. Tobacco, oil, pharmaceuticals and utilities have all done rather well. Income based strategies would have done even better if it weren't for the recent dire performance of Morrisons and Tesco, which have been worst performing FTSE 100 stocks over the past six months. This idea of the FTSE 100's emerging role as a safe haven is supported by the observation that it seems to be reacting less strongly to geopolitical events. Rapidly deteriorating relations between Russia and West and even the prospect of Scotland leaving the UK have barely made a dent. The FTSE 100 has just been moving sideways in a fairly narrow band while the FTSE 250 has been drifting down. Some commentators seem to think that the market is due for a 10% pull-back. However, I think it will take something pretty major to shake investor confidence. A vote for Scottish independence would do it, although I think this is unlikely. So basically, the last six months have been "risk off" with a net flow of capital from small and mid caps to large caps. Further, this under-performance of most screening strategies has to be seen in this context and not as fundamental failure of these approaches. These strategies should go on and outperform when the market goes risk-on again. For me, the overriding question is, where else are investors supposed to put their money? I recently got a letter from my bank telling me that they had made the "difficult decision" to reduce the rate on my savings account from 1.3% to 0.9%. I have been keeping a chunk of my savings as a war chest for the next pullback. But this means I am now losing even more money in real terms and what if my new thesis is right and a stockmarket pullback doesn't come? Putting money into defensive dividend paying stocks rather than bonds during this "risk off" phase would seem to be a sensible strategy and perhaps, the market has already worked this out. Mechanical Investing and "Fraudulent Stocks"
I will start off here with a disclaimer that I am not asserting that any of the stocks mentioned in this section are necessarily fraudulent stocks. I do not have the relevant expertise to make these judgements. However, other commentators have made these kind of assertions and so I am referring to the risk that these stocks could be fraudulent. Naibu Global International (NBU) is a Chinese AIM-listed shoe manufacturer, which released its "unaudited" interim results on Friday. For seasoned investors, the words "Chinese" and "AIM-listed" are virtually synonymous with fraud. Naibu currently has a PE ratio of less than 1, so if it isn't a fraud, then it is the bargain of the century. The company announced the suspension of dividend payments, supposedly to fund construction of a new factory. However, as the dividend was the one thing giving Naibu some semblance of credibility, investor confidence evaporated and the dropped over 40% in one day. Paul Scott gives a fuller commentary on his Small Cap Report. There is an interesting clip from the UK Investor show back in April where Lucien Miers tells of meeting a Chinese student who not only hailed from the same city where Naibu is based, but also had family connections within the shoe industry. The student had never heard of Naibu! I don't have a position on Naibu. However, I am very interested in it because my rules based system came very close to flagging it up for purchase earlier in the year. Indeed, even now, it pops up in an incredible 13 Stockopedia guru screens. Perhaps this partly explains why Stockopedia's Screen of screens has been underperforming of late. In any case, this highlights one of the inherent risks of mechanical based investing systems. It is not easy to design a system that filters out companies producing fraudulent accounts. There are some well known "red flags" that may be indicative of aggressive accounting practices. These include growing reported earnings but negative operating cash flow and the Beneish M-Score which aims to measure risk of earnings manipulation. However, the later is a probability measure that can produce false positives. One of my most profitable investments over the last 18 months was Kentz, which I almost bailed out of at a loss because of a just such a red flag. Of course, an "unaudited" set of accounts could be a complete work of fiction in which case the any red flags would be qualitative in nature and impossible to incorporate into a mechanical based strategy. Early last year I bought Globo as it had being flagged up on a large number of Stockopedia screens. Globo is not a China-based stock, but it is on AIM and anyone following Globo will be aware that it is another controversial stock. It was also subject to a bear raid towards the end of last year. Fortunately, I timed my exit pretty well and I managed to secure healthy 46% profit. However, this was almost certainly down to luck rather than any skill on my part. The problem is that "strategic ignorance" is a cornerstone of my investment philosophy. Joel Greenblatt is his book the "Little Book that Beats the Market" urges investors to "trust the quant" and select stocks at random that meet the investment criteria. He argues that the ugliest looking stocks will often deliver the best returns and that investors trying to apply their own judgement will just sucked into systematically making the wrong decisions. However, I suspect that Joel Greenblatt developed these ideas well before dodgy Chinese stocks started popping up in Western stockmarkets. Stockopedia's screen based on Greenblatt's Magic Formula has performed poorly over the past 2 to 3 years. It has performed especially badly over the last six months, falling over 13%. This is hardly surprising given it has been flagging up the likes of Quindell (another highly controversial stock) which has dropped around 70% over the past 6 months. The point here is that a purely mechanical based investment approach involves inherent risk. If you do not undertake due diligence, you risk buying into a company that may be fraudulent. I don't think it is possible to eliminate this risk, but for my part, I will be tweaking my investment rules again to filter out any Chinese based Aim stocks. Fortunately, the Mechanical Bull portfolio has so far managed to avoid any complete disasters. Hopefully I can minimize them in future. 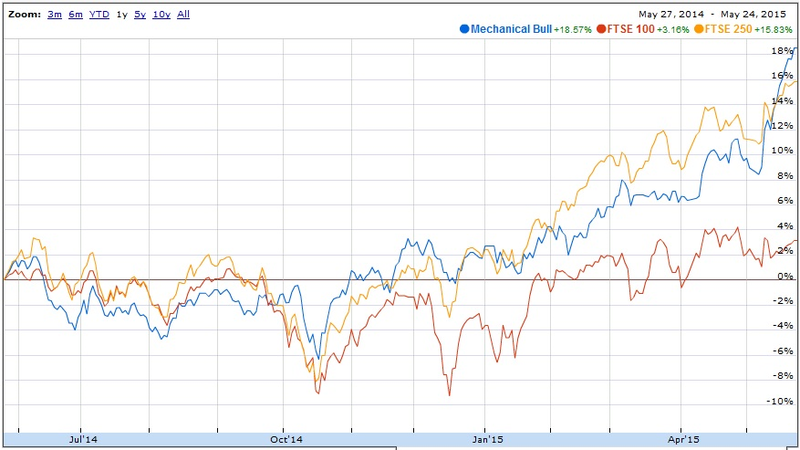 The Mechanical Bull portfolio increased by 3.3% over the month. This compares with 1.3% for the FTSE 100 and 2.5% for the FTSE 250. This continued the trend of the last six months where the portfolio has been tracking the main indices. Renew was the standout performer gaining 22 per cent. It was a busy month with VP, Dart and Staffline being sold and replaced by Amec, Wincanton and James Latham. Dart Group was sold at 208p on the 11 August for a small profit of 4.5%. This was very disappointing considering the share price topped out at over 300p in April. The Stockopedia StockRank had dropped in to the 80s and it was only coming up in one Stockopedia screen and so according to my rules it had to go. It was replaced by Wincanton, which had a MB score of 105 (100 StockRank, + 5 Screens). VP was also sold on the 11 August at 635p for a loss of 6.5%. This was bought in January this year has more or less just moved sideways. The StockRank dipped into the 80s with just one Stockopedia screen. It was replaced by Amec, which had a MB score of 103 (96 StockRank + 7 screens). Things went much better with Staffline, which was sold on 29 August for 880p, more than double the buy price. Staffline's StockRank dropped sharply in the last week of August, down into the mid-70s. In fact, Staffline was the worst performing stock during August and I would have got 100p more if this had been sold one month earlier. The profits were used to purchase a stake in James Latham which has a MB score of 103 (98 StockRank score + 1 screens). When buying into a new stock I select a position size by dividing the entire value of the portfolio by fifteen, which is the number of stocks held in the portfolio. However, since I don't bother with rebalancing, there isn't always enough cash achieve the desired position. This happened earlier in the month when buying into Wincanton and Amec, and so those positions had to be scaled back. 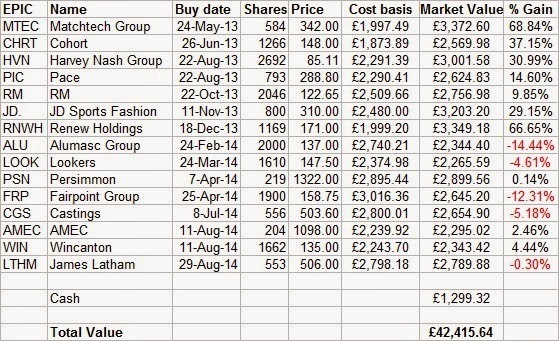 However the returns from the sale of Staffline means the portfolio now has larger than normal cash balance (£1300). I've decided to just hold this in cash to provide a bit of a buffer for when the cash from a sale does not cover the desired position size for the incoming stock. I have said before that I have not really convinced about the MB portfolio sell rules and in real life I have not been keeping to them. Dart seems oversold and it is now showing some signs of recovery. It also has a very good QV rank of 97. However, profits have been taken in Staffline. It seems to have run out of steam and it has a fairly unimpressive QV rank of 48. Its time then to tweak the buy/sell rules. Instead of selling when the MB score falls under 90, I am lowering automatic sell threshold to 80. But I will also implementing an automatic buy rule when a stock hits 105. These buys would be funded by selling the lowest scoring stock at the time. Going back through my old spreadsheet suggests that this would have allowed me to run profits longer with WH Smith and Jarvis Securities while I would have avoided some of my less successful investments like Alumasc and Aberdeen Asset Management. Also, it would have allowed me to keep Dart which is now entering a recovery phase. Overall, it wouldn't have a huge difference in performance, but its enough to warrant a change. The Mechanical Bull method is a strategy based on theory. The logic is appealing, and it has performed reasonably well over the last 15 months. However, I have had no real way of testing how well it is going to perform over the long term. I would love to be able to backtest the approach. Unfortunately, this is not possible because Stockopedia doesn't provide a backtesting service (at least not yet). Recently, I made a rather intriguing discovery. I used to be a frequent user of Sharelock Holmes, until Stockopedia launched its subscription service. Over the weekend, I dipped back into the site and stumbled over some new metrics that looked remarkably like Stockopedia's ranking measures. Sharelock now has composite Quality, Momentum and Value scores, as well as the various blended composites, including the "Market Score" which is their version of the StockRank. It uses a similar ranking score from 1 to 100 (although 1 is the best through to 100 for the worst). Now, I am certainly not advising anyone to cancel their Stockopedia subscriptions and switch to Sherlock Holmes. It is a rather dull and drab website and the screening functionality is fairly limited. More importantly, I suspect the data is not always up to scratch. I've come across errors in the past relation to handling of share splits. However, the one area where it exceeds the Stockpedia offer is in terms of backtesting. So I feel this provides a useful opportunity to see how these composite strategies play out over the longer term. 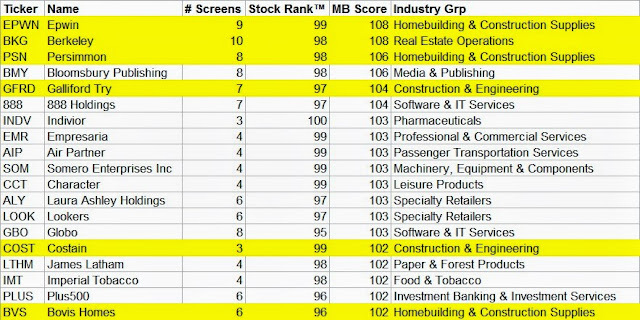 It is important to note that these Sharelock Holmes rankings do not produce the same set of stocks as the Stockopedia ranking system. Of the current StockRank top decile stocks, about 60 per cent are in the top decile "Market Score" list. Most of the remainder rank are in the second decile although a few got very poor scores. So these rankings seem to be based on very similar principles, but the implementation differs. There are also clearly differences with some of the data. Just one example I picked out was the Piotroski score for Staffline, which is 8 according to Stockopedia but just 4 according to Sharelock. Not with standing these differences some back testing of these ranking scores seemed too me to be a worthwhile project. This gives the familiar and reassuring fanning out pattern seen on the Stockopedia discussion forums, except going all the way back to mid-2003. The top decile stocks blitz the field with an especially impressive performance over the past 5 years. The chart also nicely illustrates the compounding effect over the longer term. This just goes to show how tilting the odds in your favour, even just slightly, can deliver very impressive returns over the longer term. However, it is also interesting to note that that all deciles fall away during the bear market that started in mid-2007 through to early 2009. I think this raises some interesting questions about market psychology. It seems that the market as a whole acts fairly rationally during bull markets, identifying quality, undervalued and winning stocks and dumping junk, expensive and losing stocks. However, during a bear market, fear takes over and investors seem to be willing to irrationally dump stocks irrespective of fundamentals. So, really, we should be grateful for bear markets since they generate the fertile ground for rational investors to exploit in the next bull run. My next piece of analysis involved selecting the top decile stocks for Quality, Value and Momentum, along with all the composites (QV, QM, VM, "Market Score"). For each strategy I generated a set of relative performance data for every quarter back to June 2003 for a range of time periods from 3 months to 5 years. For each of these time periods I have then averaged the performance and then annualised the data. For example, for performance data over two years, I halved the average performance to give a figure that could be compared with all the other time periods. This shows that momentum over the short term is is the single most effective strategy. However, performance drops of quickly after 3-6 months so in terms of translating this into an effective strategy you would need to factor in trading costs and spreads etc. Also, momentum tends to do badly in falling markets. A strategy based on a pure value rank performed worse of all. This result seems pretty surprising considering that value investing is so widely respected. A likely explanation is that a rules based approach to value investing may be susceptible to picking value traps, that is, stocks that are a cheap, but for very good reasons that doesn't appear in the financial data. The only time that a value based rules strategy seems to really pays-off is after the market has completely tanked. A strategy based purely on quality does consistently well over all time periods. Quality also holds up best when the market is under pressure. This suggests that quality stocks are not just for buy and hold type investors, but should probably be key consideration for any investment strategy. The combined QVM (Market) strategy does fairly well but it doesn't particularly stand out as the best approach. I suspect the under performance of value acts as a slight drag its overall performance. On this basis, the greater safety offered by quality would seem to be a price worth paying for only slightly greater short-term returns. I also produced another version for the full ten years. As explained above, this shows only partial data for the longer time periods, but it is worth showing as it incorporates the bull market since early 2009. This shows that the returns for both the Market and QM strategies have picked up relative to pure quality. If one considers that the typical holding period for a stock in the MB portfolio is about a year, then either of these strategies would offer at least a 10 percent annual return above the market. There is a lot more I would like to look at here, but something I am starting to think about is a strategy based on different phases of the stockmarket cycle. This could consist of quality, value and momentum "pots" where the size of the pots would vary according to the state of the market. For example, given where we are at the moment I might have about 70% quality and 30% momentum stocks. If the market drifts down I might go 70% quality 30% value. If another bull market I might go 50% quality and 50% momentum. Anyway, lots of ideas here and lots more thinking to do. I regularly check out the very slick dashboard on Stockopedia's home page. I've been a particular fan of the Guru Screens section. This includes a Guru index, which is a composite of all 60 or so long guru screens maintained by Stockopedia. This shows the composite Guru index steadily pulling away from the FTSE 100, accelerating away during the second half of 2013 but then falling back over the last six months or so. In contrast,the FTSE 100 has been holding its ground pretty well during 2014. Stockopedia handily group Guru screens by 'style performance' (e.g. Value, Growth, Momentum, Income etc.) so you can dive a bit more into the detail (although this is subscriber only service). Unfortunately, this doesn't really shed much light on proceedings. 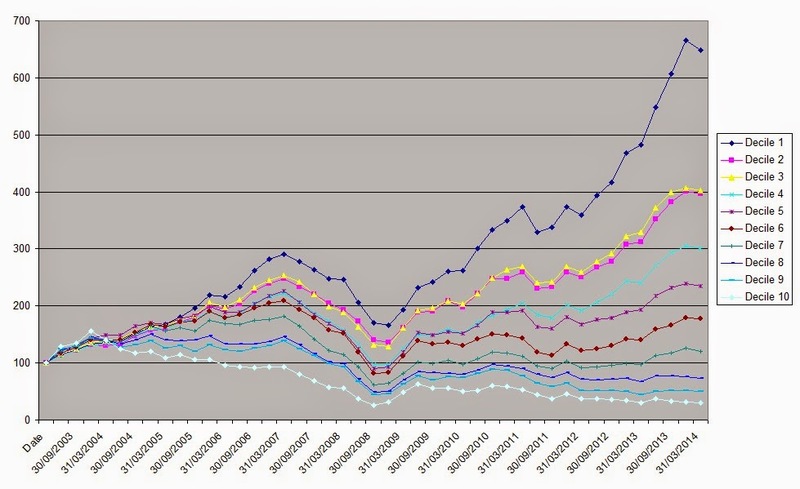 The FTSE 100 outperforms every one of these style indices over the past six months. In other words, whatever you investment style, you have probably lost money over the past six months. Unless of course your guru is a monkey with a pin and a list of FTSE 100 companies. In that case, you are probably slightly ahead. 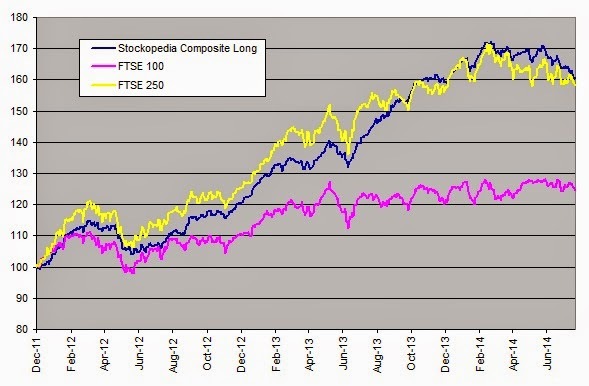 This clearly shows that the Guru composite index has been basically tracking the FTSE 250 over this period. Of course, a lot of FTSE 250 stocks appear in these Guru screens. I have done some rough calculations (rough as there isn't a straightforward way of screening out FTSE 250 stocks on Stockopedia) and I reckon about 30 per cent of all Guru screen appearances are FTSE 250 stocks. In contrast, less than 10 per cent of appearances are for FTSE 100 stocks. Even so, the strength of the correlation between the Guru index and the FTSE 250 seems remarkable. What this shows is that if you really want to test whether a strategy is outperforming, you need an appropriate benchmark. Ideally you want a benchmark that broadly represents the investment universe your picking from so you can determine whether you can identify stocks that systematically outperform. The FTSE 100 Index isn't ideal in this case because it represents such a small part of the investment universe from where the Guru strategies are drawn. There is the FTSE All share index, but that just seems to follow the FTSE 100 pretty closely, so I assume that the index is weighted by market cap. What you really want is an unweighted index of all FTSE and AIM stocks, but I am not sure if there is such a thing. If anyone knows something about these things please let me know! This also throws up the obvious question as to whether these guru screens actually help in picking winning stocks. The evidence above suggests that using the monkey with a pin method on FTE250 stocks might work just as well. I have said before that stock screening has its limitations because it is binary blunt instrument. Stocks are either in or out and there is no differentiation between a stock that clears a hurdle by a country mile and ones that just scrape in. The same principle applies for those that just miss out. I also have a pet theory that stock screening tools have become so widely available that perhaps they no longer give the average investor much of a edge. These things aside, I am pleased to have solved this riddle. When I see different markets moving in certain ways, I am always trying to work out where the money in the system is going from and going to. The pattern over the last six months clearly points to a net move of capital from smaller to large caps. The MB portfolio was down 1.3 per cent in July. This pretty much followed the major indices, with the FTSE 100 falling about 0.2 per cent and the FTSE 250 down 1.4 per cent. The was one change to the portfolio with Sweett (CSG) making me reach for on 8 July to be replaced by Castings (CGS). So that was CGS replacing CSG, which has a nice symmetery about it. There is no disguising it. June was a dire month for the MB portfolio. It was down 3.7 per cent over the month. This compares with a 1.7 drop for the FTSE 100 and a 2.2 per cent decline for the FTSE 250. The biggest loser was Dart Group. It was down by more than a quarter over the month. At one point it was below 180p although it bounced back to 205p by the end of June. This fall was triggered by a rather downbeat trading update. What was interesting for me was the widely different reactions from different quarters. Comments on Stockopedia were mostly (although not entirely) negative. A number of comments focused on concerns not at all linked to the update, such as the age of their fleet or just general negative sentiment around the airline sector. Meanwhile, punters on Interactive Investor were more sanguine. The consensus here seemed to be that the size of the drop was unwarranted and that the drop presented a good buying opportunity. Although I don’t usually follow the stories behind individual stocks too closely, Dart has been an exception. This is possibly because it piqued my interest well before I adopted my current position of strategic ignorance. So here is my take on Dart. Having old, cheap planes is actually central to Dart’s business strategy. Since their business is very seasonal, they wouldn’t be able to generate a sufficient return on capital from new planes. However, older planes don’t need to be constantly in the air to be profitable and it is easy to schedule maintenance during the off-season. It seems to me a business model that is fundamentally sound and the number of comments about the age of their fleet probably explains why Dart’s value rank is so high. Anyway, I digress. Five other stocks dropped by more than 5 per cent (Matchtech, Lookers, Fairpoint, Pace, Harvey Nash). Indeed, only 3 out of 15 stocks actually rose (RM, Cohort and VP). Ouch! However, I maintain that this is a blip and that the portfolio has just been a little unlucky. I say this because my real life portfolio held up fairly well during June and was down by less than half a per cent. This was mainly because I hold a good chunk of Kentz, which surged almost 30 per cent during June. Slight differences in timing meant that it never made it into the MB portfolio even though the selection criteria were exactly the same. I also hold Trifast for similar reasons, which was up about 10 per cent over the month. So it seems that luck can have quite an impact on the short term. The MB portfolio probably had a run of good luck last year and is having a run of bad luck now. However, luck is not a significant factor over the long term and a sound investment strategy should always outperform. I am a private investor interested in mechanical and rules based investing in UK stocks. Disclaimer: I do not offer financial advice. If you are interested in investing in stocks mentioned in this blog, please do your own research first.